Decorating with thick slip is one of the most relaxing things I do in the studio. Making all those tiny dots or squiggles can be quite hypnotic. 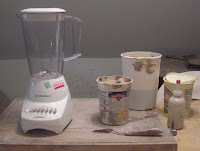 I use a white and a brown trailing slip, one each made from the clay bodies that I use in the studio, which are Miller Clay's B-mix 10, and their #700. 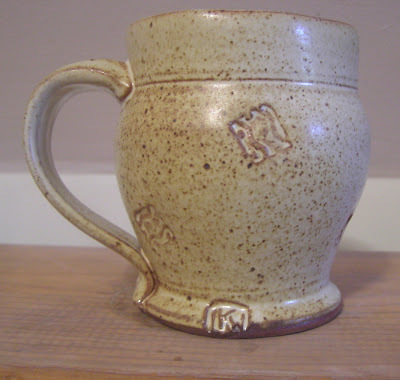 I used to mix clay from my own recipe; I stopped, but that is a whole 'nother post. Today I mixed up brown trailing slip. Every studio should have a blender. I got mine at the Salvation Army for $4, (after hubby fried my old one, also a thrift store find.) 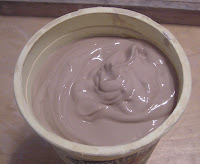 I also use a palette knife, just in case I have to stick something in the blender to work the clay mass loose. Even if the appliance is unplugged, those blades are sharp! 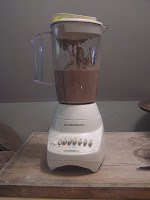 I fill the blender about halfway up with slurry from my recycle bucket, then hit "liquefy" on the settings. I'll have to add water a couple of times, trying to get to a cake-batter consistency. After pouring it into a plastic tub, I thump the container on the tabletop maybe about twenty times, to get the air bubbles to rise up and pop. 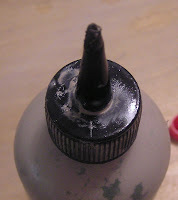 This is an important step; if you skip it you will be slipping along, making tiny little dots, when your bottle will suddenly make a flatulent noise and spit out a messy splatter of slip, and you'll have to sponge it all off and start over again. 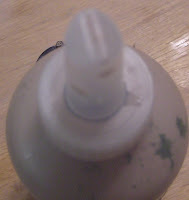 My brown slip trailing bottle has two tips. (I use seperate bottles for the white slip.) The broad tip is great for fluid lines; the pointy tip makes dots. 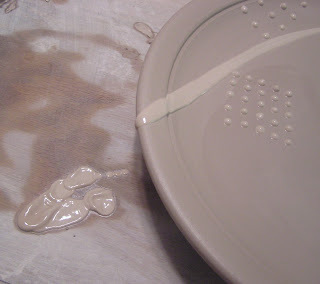 And here's another 'tip' for you: you can star making those fluid lines off the side when you are decorating a platter, so that the "starting blob" is left on the tabletop not on the platter. I get inspired to do slip work looking at Steven Hill's platters, like this one. Let's call the mugs A, B, C, and D, from the top. I apologize for the blurry shots -- my photographer husband would be mortified. But they get the idea across. I should note for my customer that although all four of my fingers fit into the handles of all four mugs, as she prefers, Mug B has the smallest handle. If she has large hands, B might not be the best choice. Other readers can vote on their preference in the poll to the right. I got off to a slow start this morning, as I woke up to a freezing cold house. Some crucial part of the furnace had given up the ghost overnight. It was far too cold to work in the studio, so I huddled in our office with the only space heater, writing an entry in my other blog. When that was done, I vacuumed, made beds, and generally picked up the house, keeping moving to stay warm. I couldn't leave, because I was waiting for the furnace guy to come and charge me $250. Even without a heating crisis, I have a bad habit of putting household tasks before my studio work. I'm not Felix Unger, but I feel guilty if I am potting away when the carpets need vacuumed or there are dishes in the sink. My hubby has no such compunctions, so why do I? When my home and my studio were on Portland's Munjoy Hill, I had the most delightful neighbors across the street. Mary and Martha, their daughter Olivia, and their little pug Gracie were such a joy to encounter, I always felt as though I lived on Sesame Street. In 2005 I moved to Augusta, where I had bought a house and about the same time Mary and Martha moved their little family to California. So we said our goodbyes, sad and happy. A few weeks ago, I was contacted through my website by a friend of theirs in California, Karen B., who was purchasing a casserole. As it turned out, the casserole was a wedding gift for my dear friends! And finally, finally, the kiln is fired, the pots are out, and here are the two best casseroles, one of which will fly off to California. I'll send Karen this link to choose, but in the meantime I've been playing around with the Blogger widgets, so I've added a poll, to the right: Which casserole would you choose for Martha and Mary? Best wishes always to two of the most loving people I've ever met. What, exactly, is body reduction? 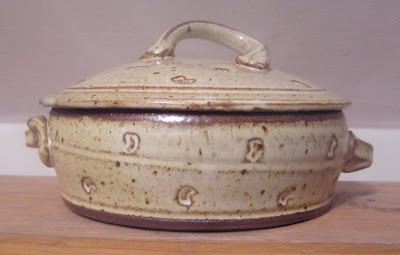 Since glaze colors develop during the glaze reduction phase of the firing, why can't I skip this step? 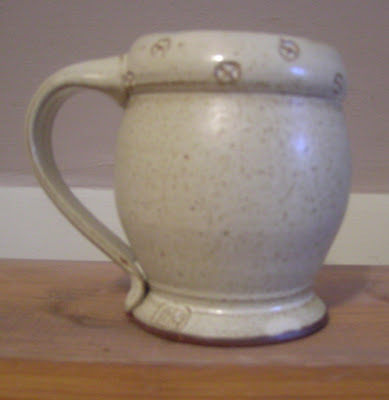 Body reduction is the reduction of oxygen to the kiln relatively early in the firing. 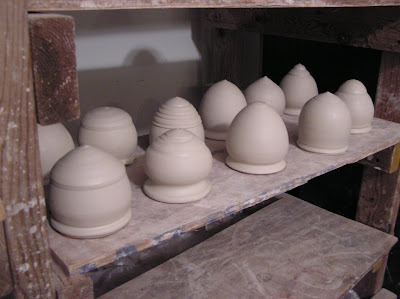 Typically I enter body reduction NO LATER than cone 010, and put the kiln into a slightly reducing atmosphere at 05, where it will stay until glaze reduction, around cone 8. It must occur prior to glaze sintering, because the function of body reduction is to act on the iron in the clay body (hence the name), which will become unavailable to the action of the flame once sintering has begun. 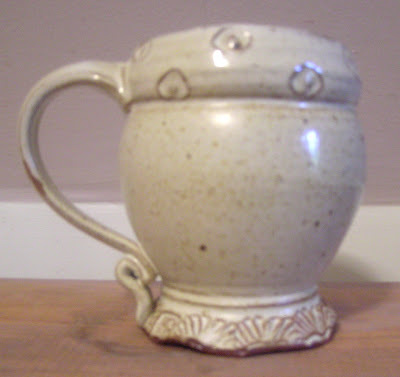 That said, glazes are certainly not unaffected by body reduction. 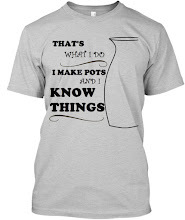 Remember that glaze is not a two dimensional surface. 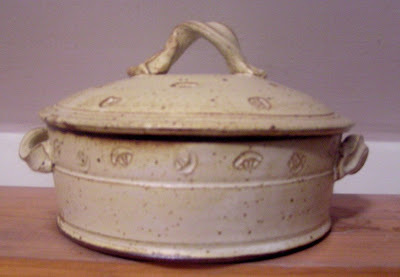 The interior of the glaze layer, which is to say, the part nearest the clay, also must be reduced prior to sintering, or again, the skin of the glaze will prevent the flame from acting upon it. Copper reds are particularly prone to fail if body reduction occurs too late, regardless of what happens during the final reduction phase. (Possibly they just tend to sinter at an earlier stage.) 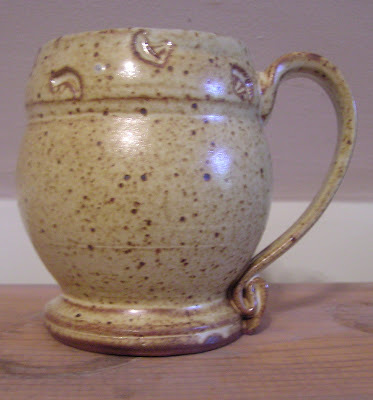 Depending upon how high you bisque, your clay body, and at what stage your earliest glaze begins to sinter, you could enter body reduction around 012, possibly; too early and your ware will experience bloating. Which is better than you experiencing bloating. Well, sort of. Your ware is ruined, your just have to eat better. 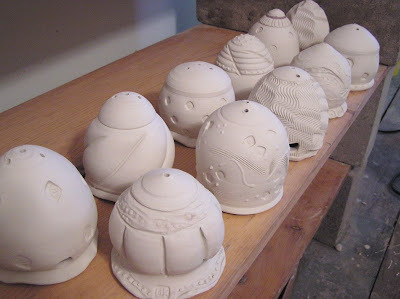 We spent the afternoon glazing for this weekend's firing. Nothing like enjoying the warm sunshine while getting work done, and the best part? No mopping afterwards. We'll be loading early in the AM, cutting the candle to a (relatively) brief four hours, hopefully firing off by eight or so. One thing that should have been on my to-do list and was not, is recycling. I didn't do much while in the summer studio - there's just not space - and I got a little behind. I recycle with one dry bucket and one wet bucket. 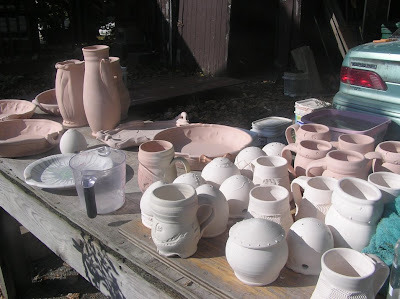 I just throw all of my stoneware in the same buckets, regardless of color -- firing temperature is the only distinction I make, and right now I am only firing to Cone 10, so that's not an issue. 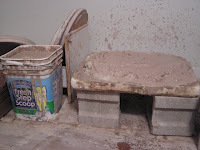 Any clay which is too dry to use goes into the dry bucket, to dry our further, hopefully completely. 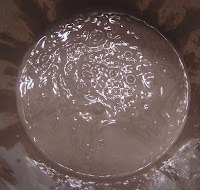 Any clay which is too wet to use, with some exceptions*, goes into the wet bucket, where I keep enough water to just cover the solid clay all the time. When the wet bucket is full, or just when I have a few extra minutes, I scoop out the slurry and spread it onto a plaster block, about 18" x 24". This size recycles enough to fill a 25-pound bag such as you get purchased clay in. It takes a few days or a week -- more if it's been damp -- but when the clay is throwing consistency or just a little wetter, I roll up the now-solid mass and put it into a used clay bag, where it needs to sit for a month or more, homogenizing. Then I pour the contents of the dry bucket into the wet bucket, as much as it will take, and pour my throwing water in enough to cover it. Having two or more clay bodies in the mix produces some interesting results, and, rarely, will create a body which is better than either of the two parent bodies. This variation is one reason I recycle, the others being a temperamental aversion to waste, and my fabled frugality. 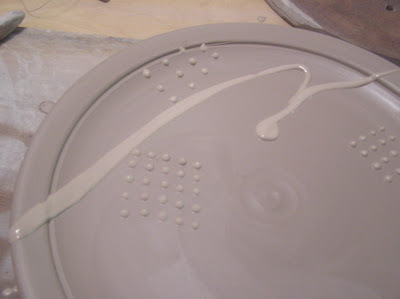 *The exceptions I mentioned earlier are clay which is only a little too wet, such as a bit of cut-off rim. I keep a small bowl lined with a piece of canvas near my wheel for these bits. The canvas wicks away just enough water that these don't have to go through the recycle process. Believe it or not, it makes a difference! ...and here, after I've had some fun with them! One note: I haven't done a serious art fair since the 2003Baltimore ACC show (when the city got three feet of snow and shut down entirely. I ate out of vending machines for days.) My display was old then, and looking at it set up at at Gilsland Farms, it is looking shabby and half-assed. I almost think I shouldn't have done the show if that's the best I could do; but they invited me, and so...anyway, it's there now, and I resolve to redesign and rebuild the display before the MECA show in December. 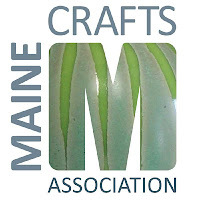 I also need to make time for a longer-term goal, to create a body of sculptural work to perhaps have a show in the spring. Somehow everything else seems to take priority. Beginning classes start again on Monday, intermediates on Tuesday.